My day blasted when my sister in law sent me this picture message from her phone. It was one good afternoon when she's probably eating her snacks and she found out something funny with her animal crackers. 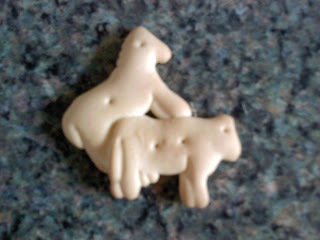 I know, nothing is perfect and sometimes this animal crackers have deform. And this one is just perfectly funny. Another defect that we can't control. We can make a good movie out of this one here. Invest to have a good film or if not just simply enjoy the one I have here. Also, I found this good website where you can enjoy the guitar player movie. I like it that is why as bonus to the funny picture here I want to share this great website. I do hope you enjoy watching the movie and film they have.